I’ve been working really well with my rotation so far this year – much better than any other recent attempts … perhaps this time I really will stick to it! After washing poor old Angel of Love after the hand sanitizer accident, I put her back on the scroll bars to finish my rotation slot (10 hours each slot) … after stitching a fair bit, I had yet another accident with her!! My sinuses were blocked up so I reached for my little jar of Tiger Balm so I could spread a bit under my nose to help to clear it … only to find when I tipped up the jar to dip my little finger in that the whole top of the jar had melted in the high heat in my bedroom, and dripped onto my stitching 😦 Now dropping hand sanitizer on it is one thing, but melted Tiger Balm that contains eucalyptus oil as well as other things is a whole different kettle of fish … I had ‘lovely’ splotches on my fabric all the way down in a little row thanks to it leaching through every fabric layer on the scroll bar! Back she went into an overnight tub soak with some Orvus – the marks haven’t come out 100%, but almost … there will probably only be one part that may not be covered by stitching, but thankfully it looks like a bit of fabric mottling now so I should be able to get away with it. Time for a Rotation again? Plus Mum and I placed a small order with 123stitch to re-order the missing threads I need that are waiting for me back home – at least that way I can still continue to do some form of stitching over here, which I have to admit I’ve been loving at the moment … I can’t remember the last time I stitched every single day for over a week at a time … sheer bliss!!! Finishing – Trying to whittle down a pile of finished-unfinished objects … will be great to see them made into their final shapes! 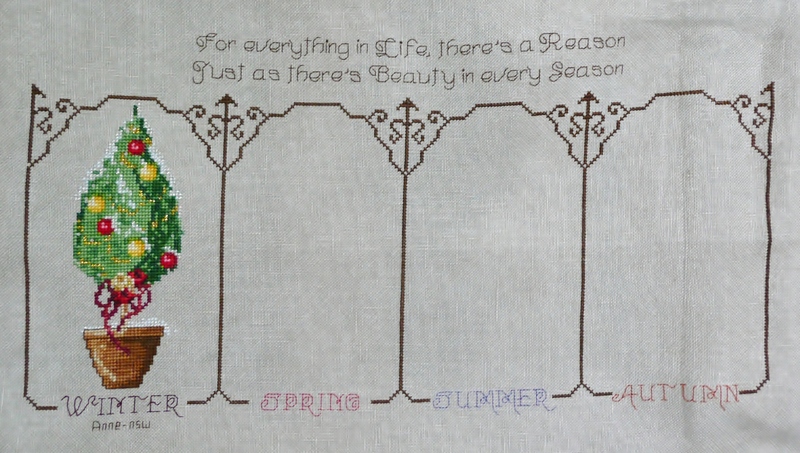 I used to follow a stitching rotation and loved it immensely, but it fell by the wayside when I started housesitting last year and I became somewhat of a one-at-a-time stitcher. I don’t feel I’ve achieved as much stitching as I have in the past, and wonder if getting back into a formal rotation will help. I’ve been considering this for some time now (since my mojo kept disappearing), and Nicki published a recent post that has helped to spur me into action. 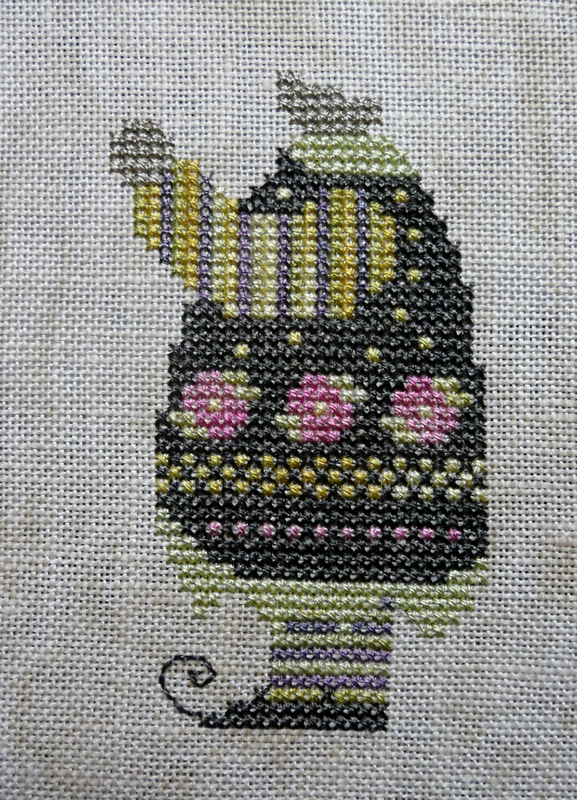 Half of my trouble is that I can’t decide what to stitch next as so many wonderful, awesome projects are all screaming at me at the same time, so following Nicki’s ideas, I decided to split my kitted-up projects into groups … then I’m using my old “UFO” method to decide what to stitch next – I used to have a numerical list of all my UnFinished Objects, then on Tuesday nights I’d draw a numbered tiddlywink counter/disc out of a pot, and whatever project matched the number on the plastic disc would get my attention for the evening. 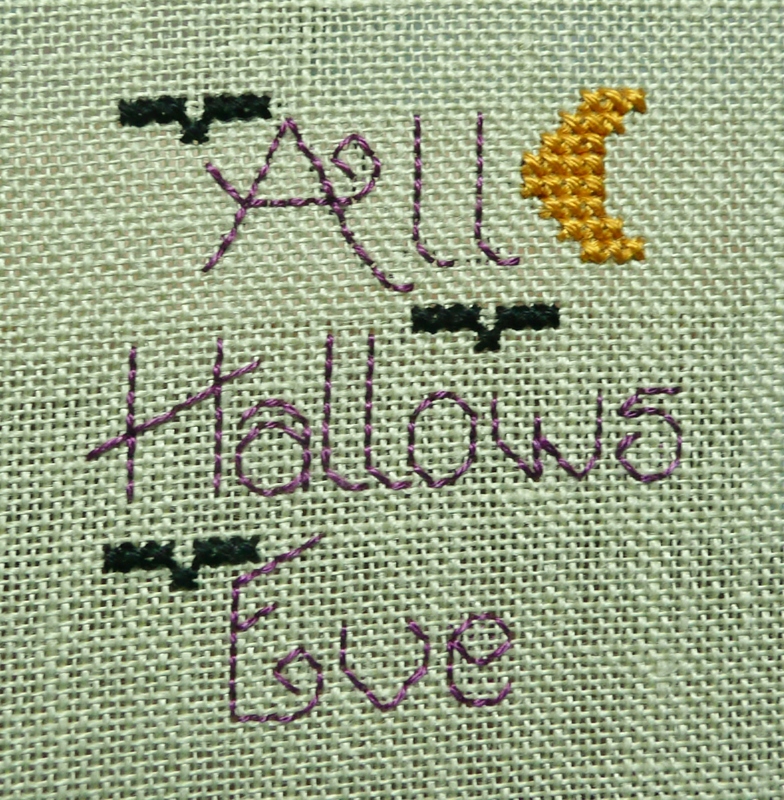 This worked perfectly for those projects that I truly disliked, but one night was enough to get some progress happening … some projects would only get one length of thread stitched, but eventually those UFO’s on the list started getting whittled down in numbers. Anyway, I thought I’d keep a numbered list within each of my groups of projects, and randomly draw a number out of my tiddlywink counters/discs whenever I need a new project to start … and I’ve kept a “Free Choice” slot for those occasions when I just HAVE to stitch something in particular and can’t wait for its number to be drawn.